If you are looking for affordable 410 shells to get you out to the range this product is for you. This loose packed bag of 25 rounds contains 2-3/4" and 3" 410 shotshells that carry some variant of birdshot. You can expect to see different manufacturers as well as shot sizes in this bargain bag. 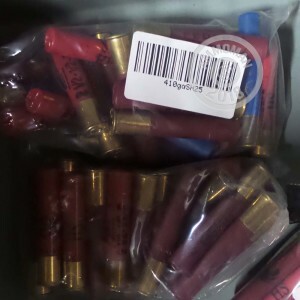 These mixed 410 shells are available to purchase to due some kind of cosmetic damage on the original manufacturers packaging. When the outer box is damaged, we can not sell the ammo as "new from the manufacturer," so it is repackaged and sold at a discount. The shells are in perfect condition and you may find some high brass loads mixed in. Pick up a couple of these bags before your next day at the range and remember at AmmoMan.com, all orders over $99 will ship for FREE!